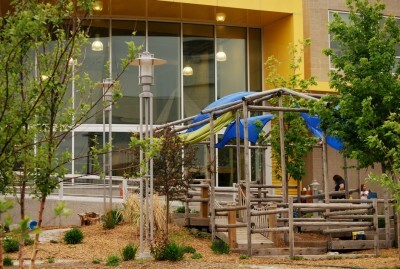 The Nature Explore Classroom at Child Saving Institute located at 4545 Dodge St in Omaha, NE is the 9th Certified Nature Explore Classroom in Nebraska (the 2nd in Omaha) and the 34th in the nation. Designed to mirror their indoor classroom, this space is inviting to children for quiet activities involving one or two children or large groups. 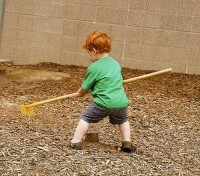 All areas provide opportunities for children to use their imagination and develop their sense of curiosity. The Child Saving Institute Nature Explore Classroom is spread over a large area with high and low points that enable teachers to have visibility at all times. 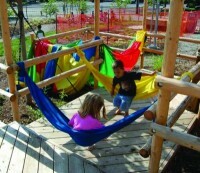 They have incorporated large spaces for running and tumbling with a path for riding toys. Other areas have been developed to foster fine motor skills using blocks and other items. An abundance of trees and plants have been included in and around all the areas of the classroom. The sitting area contains large logs and tree trunks. A garden space allows teachers and staff an opportunity to change the plants available for exploration each year. A butterfly garden with many delicate and colorful flowers delights children during the summer and fall. This space is maintained with the help of staff and volunteers with the children also engaging in the clean-up process. Throughout the year, family activities, picnics and infant/toddler play groups have been incorporated. The relaxing flow and natural beauty of this classroom enable children to bring learning from the inside to the outside and to connect with nature.